Register Now for Mineral Exploration Roundup 2016! This year AME BC is offering all-access passes for either the full conference or single day attendance. 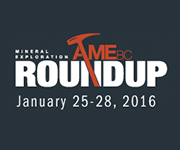 All registrants of Mineral Exploration Roundup 2016 are granted access to the Vancouver Resoure Investment Conference on January 24-25, 2016 Click here to view registration options for Mineral Exploration Roundup. Take advantage of the savings by registering before the Early Bird Deadline of December 18, 2015 and purchasing your 2016 AME BC membership. When you purchase your 2016 AME BC membership, further discounts are available for students and seniors. One-Day Delegate passes are still available as well.